December is a busy month for recreation therapists, activity directors, and any activity worker. This can be a stressful period for clients. Good recreation programming will involve clients in the planning process. While visions of sugar-plums danced in their heads." Objective: Students will manipulate clay and use brushes to apply slip. Students will observe/feel the changes in clay from impermanent to permanent states. Students will make a pottery item that can be given as a gift. Note: This could be used as a series of lessons or just one lesson depending on the ability of students. It can be beneficial to photograph the various stages of the process as an additional learning tool and then make up a poster as a permanent record. Students: This lesson can be used for a small group and adapted depending on ability. Special care and individual attention needs to be given for students inclined to mouth objects. Slip is liquid clay with oxides and stains mixed in. Materials: Terracotta or earthenware clay, heavy calico or newspaper for rolling clay onto, rolling pin, circular lid for cutting out circles of clay (6 or 7cm in diameter), a straw for making the hanging hole, a sponge, coloured slips (green, dark pink, yellow, white and blue), paper Christmas cutout stencil shapes (see below), several soft brushes, clear gloss glaze, Christmas ribbon, carving tools or pencils. Safety issues: Keep dust to a minimum by using wet sponges to clean up, keep clay blocks covered with plastic when not used. Use aprons and make sure all clay is cleaned off students at the end of the session. Roll out clay to a thickness of approximately 6 or 7mm. Cut out circular shapes using the lid or egg ring. Cut the straw into 3cm lengths and use this to make a hole approx. 1cm from top or circles. (This could be done in advance by the teacher if students are unable to do this). Students could make 2 or 3 each. Write student name on the back as well as a Christmas message such as Merry Christmas, Seasons Greetings, Peace or Love. At this point students could touch the clay and make some light markings on them (if the markings are deep the cutouts won’t apply properly and the coloured slips may run underneath). Lightly sponge the tops of the circles and apply the cutouts in various patterns. The moisture will assist with making the cutouts stick to the clay. Have a brush in each colour of slip. Use one colour or several colours over the top of the cutouts. Use fairly thick amount of slip and quick brushstrokes. Letting a colour dry out a bit before application of another will stop colours from running together (although this can be a nice effect). Have water available to clean brushes between colours as needed. Burnishing option: When clay is leather hard (still has some moisture in it but firm to the touch), you can use the back of a spoon and rub gently to give a smooth finish on the back of the works. You may need to re-carve the message as the burnishing will often smooth out that too! Once the slips have completely dried (overnight or less time if the weather is warm) gently lift off stencils to reveal the designs in terracotta beneath. Once completely bone dry bisque fire as per clay instructions. Sponge off bisque circles front and back. Apply clear gloss glaze. Glaze firing as per glaze instructions. Allow students to touch their finished pieces. You could also allow them to touch the unfired clay and the fired clay and have them describe or indicate soft/hard, wet/dry, smooth/rough verbally or using pictures. Apply ribbons or other trimmings to the pieces, they can be wrapped up effectively in clear cellophane paper with a chocolate as a lovely and unique handmade gift. 1. 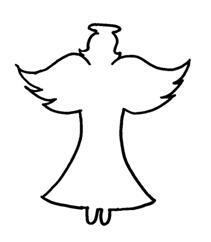 Make about 6 angels and fold over paper and cut out with scissors. 2. Fold up paper to make a then cut out multiple trees like a paper doll then you drape a row of trees across the clay for a nice effect. 3. You can do a similar fold with the star to make a row of stars or single stars. They only need to be about 3 to 5cm in height. Equipment: Brown poster board, construction paper, colored foam, paints, markers, etc. Objective: Seasonal orientation, artistic self expression, sharing ideas. Description: Make a bare tree from poster board, ( any size, ours is about 3 feet high) Each season and or holiday gather for ideas on what to put on the tree, ( affix items with ""sticky putty"" to remove easily) Example: sponge paint leaves for the fall, cut out holly from foam or construction paper for X-mas, dreidles for Hanukah, flowers & birds in spring, snowmen, suns etc. Decorate tree with items. This makes a good central point near perhaps the rooms bulletin board, is colorful and good source of season orientation. Equipment: Candy canes, Strips of fabric, glue. Description: Place cinnamon in a bowl. Slowly mix the apple sauce in with the cinnamon You should have a dough like consistency. Place dough on wax paper and place another piece of wax paper on top. Roll the doe with a rolling pin. Cut out shapes with cookie cutters. You can use other cookie decorations such as silver and gold balls found in the cake decorating area of the stores. Make a hole in the top and let dry. It takes approx. 24 hrs to completely dry. Thread a ribbon through the hole. These are very fragrent but don't eat them. Equipment: Green construction paper, puzzle pieces, tacky glue, green spray paint, newspaper, thin red ribbon, decorative string. Objective: A fun way for clients to achieve a sense of accoplishment and to include them in the decorating process for Christmas. Description: Cut a circle from green construction paper that measures approximately 3" in diameter. Cut the middle out of the circle to leave a wreath-like ring. Take puzzle pieces (I used a puzzle that was missing pieces) and begin gluing them onto the construction paper face side up. Glue 2 more layers of puzzle pieces, staggering the layers. Spray the wreath with green spray paint(make sure you have plenty of newspaper). While the paint is drying make bows from the red ribbon. Then, glue the ribbon to the front of the wreath and glue the decorative string to the back so it can be hung from the tree. Objective: This activity is so easy that people with severe dementia will enjoy. They will receive pleasure looking at the colorful cards & feel successful making an ornament for themselves or as a gift. Description: Put out a large number of old Xmas cars on a table. Allow the residents, patients, etc. to browse throught the cards & pick one they like. Ask them to show the part of the card they want cut out, such as Santa, xmas tree,etc... Keep the size of the card appropriate for an ornament. Trace the desired area with a dark pen & have resident cut out if they are able to. If not, the rec. ther. or act. dir. should do. Glue felt to back of card & trim excess. Punch hole on the top & put ribbon through to make a loop to hang from tree. An instant ornament & also makes a great gift for someone to give. Instruction: Ask each person in the group at least one question from the list below. If they answer YES to one of the question, write their name on the line beside the question.... then go on to the next person and ask them another question until the entire sheet is completed. Important: a person name can only appear once on this sheet. When done, turn this sheet to your group leader.